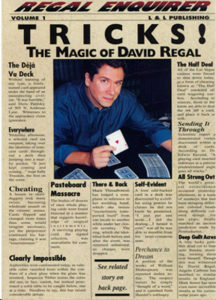 The Magic of David Regal Volume 1: Tricks! David Regal put out a 3 series project entitled The Magic of David Regal. This review focuses on Volume 1. For those that don’t like wasting time reading entire reviews (books or articles) and just want the New York Post headline: REGAL NAILS IT! This two hour and thirty eight minute download starts off with Regal’s parlor show to your typical L&L audience. I am not going to have much negative to say about Regal, his tricks or his teaching because it is all great. However, I cannot stand his audience. Seriously, they are terrible. The reactions are over-the-top and unbelievable. He has a volunteer who is perhaps one of the worst actors known to mankind. This dude is laughing out of control at things that are not funny, making faces of amazement that are not credible and he is just downright annoying. Overacting anyone? He comes off as just plain old dumb. Yup, I said it. I said it and now I feel so much better and a bit ashamed for thinking it, but it is what it is and I am positive I am not alone in having these hateful thoughts. “David Regal, when he isn’t writing for television shows like Rugrats and Everybody Loves Raymond, creates diabolical magic. And, on these three new downloads David performs and then teaches killer effects from his Magic Castle act as well as the bestselling books Close-Up & Personal, Star Quality and the forthcoming Constant Fooling. 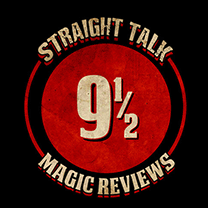 The 36 close-up items taught on these three downloads are capable of fooling well-posted magicians, yet are exceedingly entertaining to laypeople. What’s more, because of David’s singular and sometimes unusual methodology, almost all of the effects are surprisingly easy to perform. First, you’ll be entertained and fooled along with the studio audience and then delighted as David takes you behind the scenes and shows you the extremely clever workings of his magic. More amazing than an Elvis sighting, these three new downloads are your chance to get really close-up and personal with the star-quality magic of David Regal. Volume one costs $34.95 and it is great and very worthwhile. Regal is a great magician and performer and his tricks are worth performing. There is nothing too difficult to learn, although some of the tricks will require some practice. The download can be purchased from any Murphy’s Magic dealer.